Yesterday I drove down to Bloomington to spend part of the day with my homeschooling coop friends. 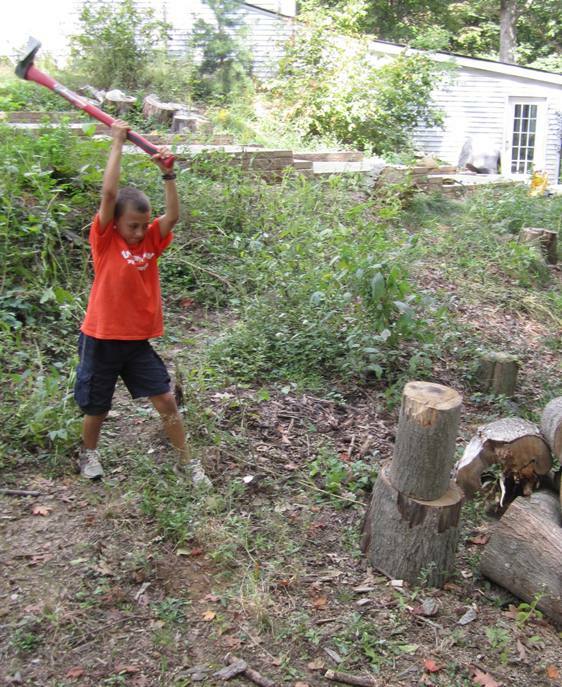 These two families use homesteading activities as the basis for their children’s learning, along with traditional math workbooks, writing assignments and the like. 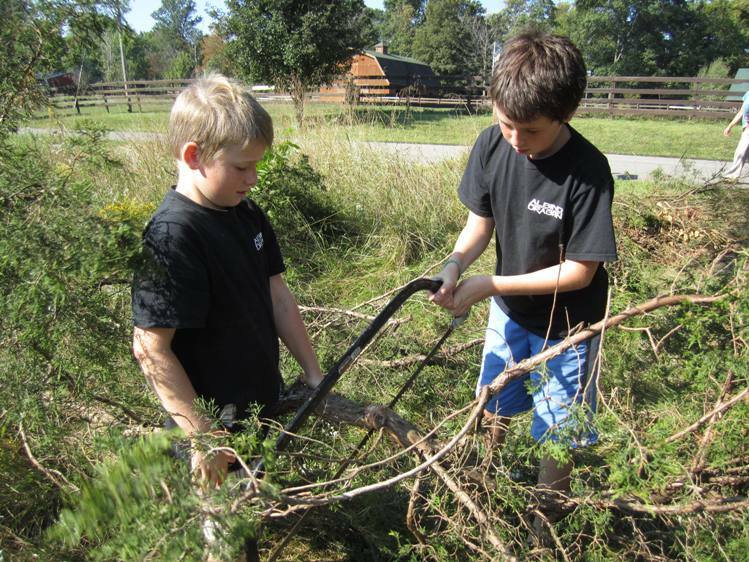 The task of the morning was to prepare cedar limbs to build a spit for cookpots over a campfire. 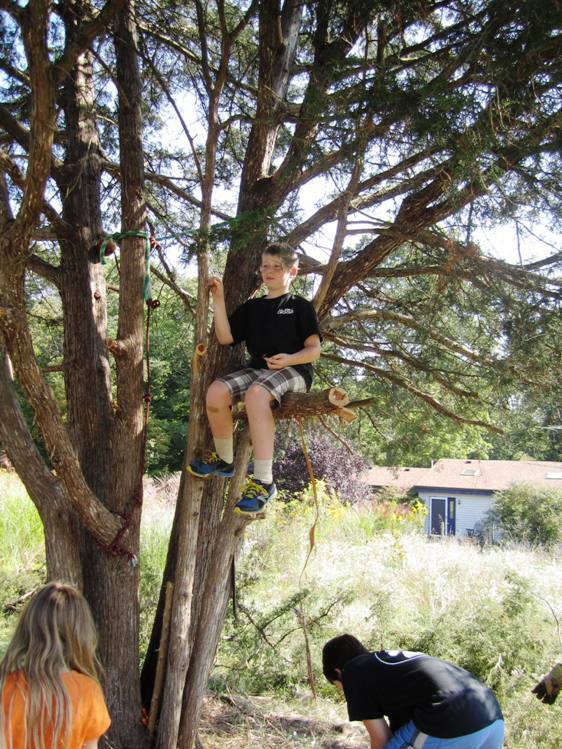 The previous week, the kids had cut branches off the cedar tree, with a goal of being able to climb it. They’d christened it Fort Cicada. Climbing ropes and nubs of branches make it easier to scale Fort Cicada. The brushy limbs now needed to be trimmed and the bark removed with a draw knife. The kids coached me on sawing. I can’t remember the last time I sawed something. It’s satisfying to cut right through a branch and have it fall. The draw knife was a revelation. 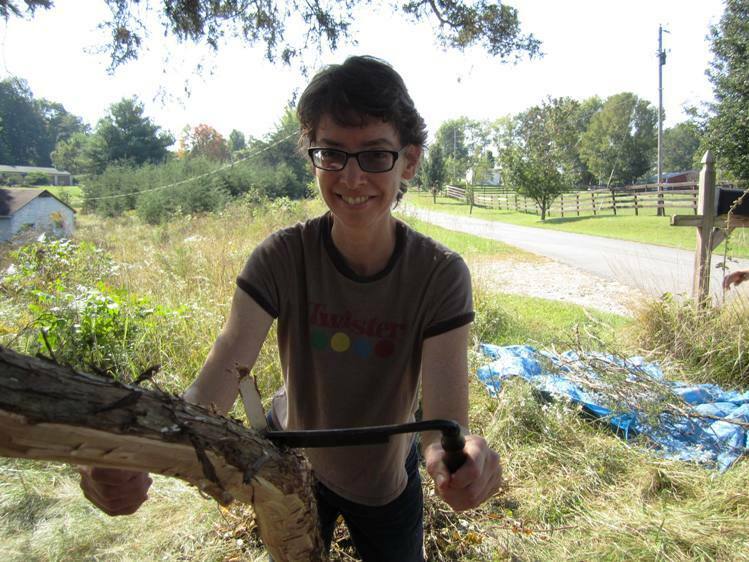 I have never experienced the pleasure of skinning a tree branch with a sharp instrument. I wasn’t sure I was qualified for the work, but the kids taught me well. They assured me that they would use a regular knife to shave around the knots where the draw knife caught. 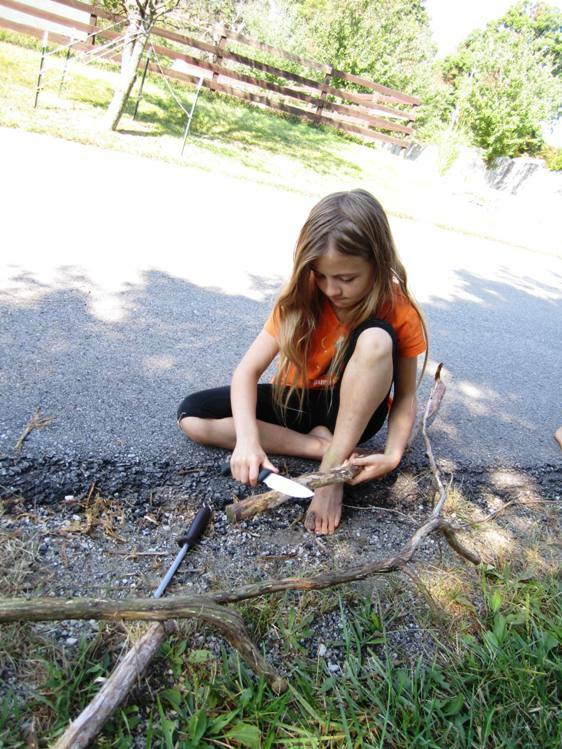 Here’s the youngest, working with her knife. I love how fearless these kids are. I find that my own hands are better suited to a keyboard than a hand tool. Yet, I pulled off a passable job on bark-peeling task. After a while it was time for lunch (fresh-baked bread!) and conversation. I asked the four kids what life would be like if they went to a school where they sat at desks all day. They agreed that they wouldn’t have nearly as much fun and flexibility in their lives, and probably not be as fit. Nor would they spend as much time with their families. On the flip side, they have to schedule activities to connect with larger groups, whereas students in school interact with lots of different kids daily. Asked how their education is preparing them for adulthood, they pointed to skills like gardening, cooking, and researching solutions to problems. After lunch, it was time to split maple logs and stack wood for the winter’s fuel. This was more fun than I expected. I consider myself something of a pipsqueak—but seeing the kids demonstrate, I thought, why not try? After numerous tries and tons of pointers from the peanut gallery, I managed to stick the splitting maul in the top of the log. I whapped at it with a mallet till the firewood split with a satisfying crack. Alas, no one captured the moment on film, but I have the sore muscles to prove it. All in all it was a great time with lovely people, and felt wonderful to be outside doing real work on a pristine fall day. 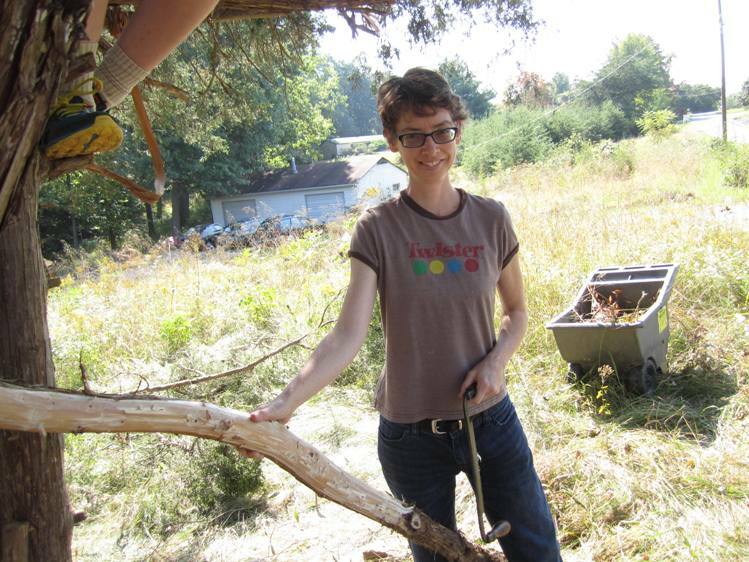 This entry was posted in Education, Homesteading and tagged Alternative schools, Cooperatives, DIWO, Do-it-with-others, Garden, Hand tool, resilience, Self-sufficiency, Small but Mighty, Sustainability. Bookmark the permalink. I congratulate you on your success in working with the wood. My father cut down a tree in my lot on labor day. It was impressive. I just video taped his work. Sharp instruments and I do not mix. Young people do have great skills to share. I am designing my Oct. 11th workday to include young people in the moving of bricks and in the video documentation. Your children are lucky to be home schooled and get opportunities to try out things that will have a practical use in later life. Well done on the wood paring. Hi Bridget! They’re not actually my children, but yes I do agree. I think they are extremely fortunate to learn through real-world activities.